Here ye! Here ye! 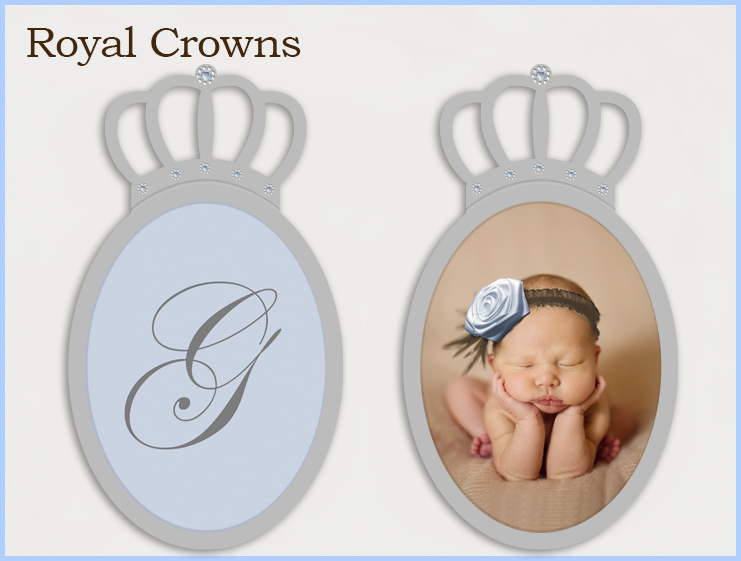 Now presenting our beautiful Royal Crown Collection - exceptionally exquisite wall décor for posh tots. Hand-embellished with brilliant Swarovski crystals, these regal works of art are the ultimate decorative luxury for a little prince or princess' fairy tale-inspired nursery or bedroom. Our royal crowns are hand-crafted and custom-made in the USA using green-certified wood and feature one-of-a-kind canvas art and personal portraits. Images are reproduced on museum-archival-quality canvas using the giclée method of fine art printing. To preserve the integrity of the images for years to come, the surface of the canvas ovals is glazed with a UV protective finish. Oval monogram art images are offered in a myriad of pleasing color palettes. Simply select a design and color way, or create a custom creation of your own. For the customer who wants a specific decorative look, custom color matching the art image to bedding and/or paint is always an option. See individual product descriptions for details per design. Oval portrait photo submissions must be at minimum of 300 dpi and measure at least 8in. x 10in. for the Petite Royal Crown and 16in. x 20in. for the Grand Royal Crown. Photos received will be cropped to fit the proportions needed for the final image, unless otherwise specified. Photos may be placed into the art composition "as is" or digitally enhanced and/or edited through a program called Photoshop to suit your individual style. • Converting a color photo to a warm sepia tone. • Applying a warm or cool color filter to a color photo. • Converting a color photo to black and white. • Colorizing up to 3 elements within a black and white photo format. • Corrective editing, such as the removal of red eye and/or blemishes. • Petite Royal Crown - External Wood Dimensions - 9in. x 16in. • Grand Royal Crown - External Wood Dimensions - 18in. x 32in. Finished products ship within 2 to 3 weeks from receipt of order, following a proof approval from the customer (email only). For royal crowns with photo insertions, email your photos to dishandspoon@comcast.net. Or mail your photos to our graphics department at the following address: Dish and Spoon Productions • 7300 Beaumont Court • Pleasanton, CA 94566. We cannot reproduce copyrighted photographs and reserve the right to reject any photo. Displaying Products 1-0 of 0 Results.